(a) If the symptom is applicable to any of the following, it is intended behavior, and not a malfunction. A longer route than expected is chosen. Depending on the road conditions, the navigation receiver assembly may determine that a longer route is quicker. Even when distance priority is high, the shortest route is not shown. Some routes may not be advised due to safety concerns. 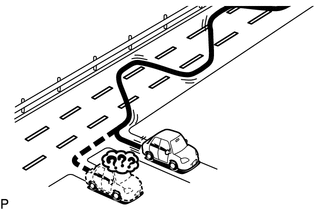 When the vehicle is put into motion immediately after the engine starts, the navigation system deviates from the correct position. 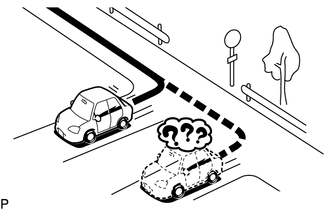 If the vehicle starts before the navigation system activates, the system may not react. When driving on certain types of roads, especially new roads, the vehicle position deviates from the correct position. When the vehicle is driving on new roads not available on the SD card, the system attempts to match it to another nearby road, causing the position mark to deviate. Expected arrival time is earlier than current time, or time different from expected arrival time is displayed. If a destination is set to a point where a different time zone is used, the system displays an expected arrival time corresponding to the time zone of the destination. 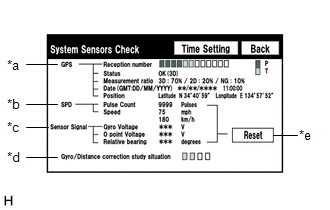 If a location on the sea is set as the destination, the system may display an expected arrival time corresponding to the time zone setting of the vehicle. Check which communication is not used for displaying traffic information. 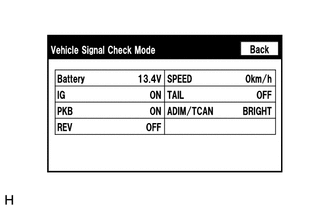 (b) The following symptoms are not malfunctions, but are caused by errors inherent in the GPS, gyro sensor, speed sensor or navigation receiver assembly. (1) The current position mark may be displayed on a nearby parallel road. (2) Immediately after a fork in the road, the current vehicle position mark may be displayed on the wrong road. (3) When the vehicle turns right or left at an intersection, the current vehicle position mark may be displayed on a nearby parallel road. 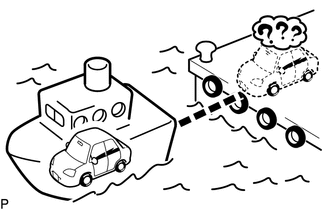 (4) When the vehicle is carried, such as on a ferry, and the vehicle itself is not driving, the current vehicle position mark may be displayed in the position where the vehicle was until a measurement can be performed by the GPS. 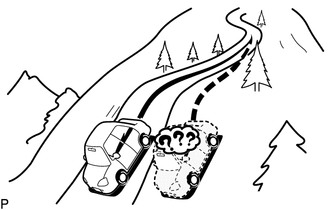 (5) When the vehicle travels on a steep hill, the current vehicle position mark may deviate from the correct position. 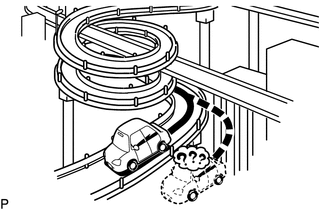 (6) When the vehicle makes a continuous turn (e.g. 360, 720, 1080 degrees), the current vehicle position mark may deviate from the correct position. 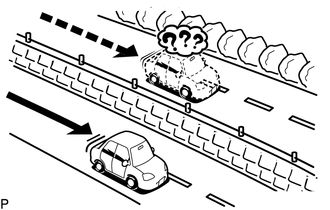 (7) When the vehicle moves erratically, such as constant lane changes, the current vehicle position mark may deviate from the correct position. (8) When the ignition switch is turned to ACC or ON and the vehicle is turned on a turntable before parking, the current vehicle position mark may not indicate the correct direction. The same will occur when the vehicle comes out of the parking garage. 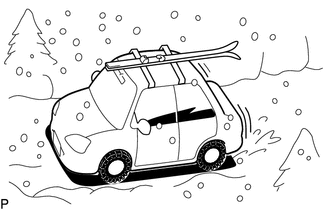 (9) When the vehicle travels on a snowy road or a mountain path with tire chains installed or using a spare tire, the current vehicle position mark may deviate from the correct position. 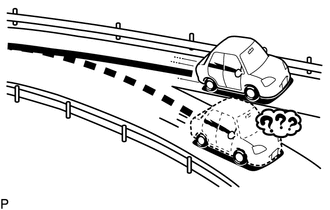 (10) When the tires are changed, the current vehicle position mark may deviate from the correct position. 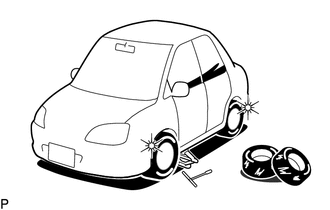 A change in tire diameter may cause a speed sensor error. 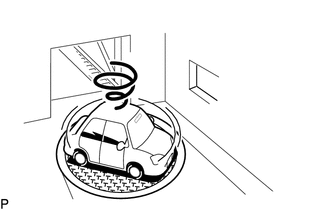 Performing "tire change" in calibration mode will allow the system to correct the current vehicle position faster. Check the SD card installed in the navigation receiver assembly. 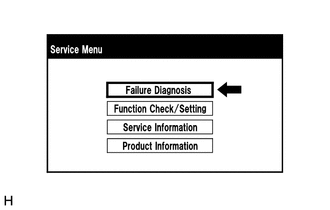 (b) Select "Failure Diagnosis" from the "Service Menu" screen. 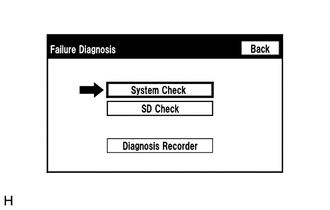 (c) Select "SD Check" from the "Failure Diagnosis" screen. 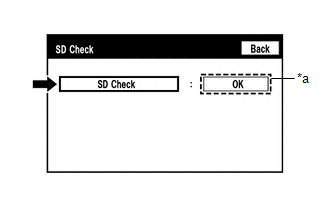 (1) Select "SD Check" to start the SD card check. 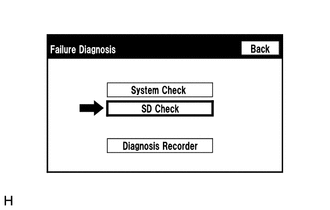 (2) Check the result displayed when the SD check is complete. After selecting "SD Check", it may take a while until the result is displayed. If the cabin temperature is -20°C (-4°F) or lower, or 65°C (149°F) or higher, the SD card may not operate normally, and "NG" may be shown on the display. Make sure to perform the inspection with the cabin at an appropriate temperature. If "NG" is displayed even when the cabin temperature is appropriate, replace the SD card with a new one. 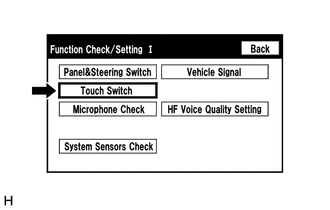 The navigation receiver assembly panel switches and steering switches are checked in the following procedure. When the "APPS" switch is pressed and held for 3 seconds or more, diagnostic mode will be canceled. The "+" mark remains on the display even after the finger is removed. 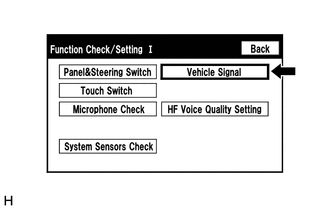 Vehicle signals received by the navigation receiver assembly are checked in the following procedure. Brightness state DIM (with) / BRIGHT (without) is displayed. This screen displays vehicle signals input to the navigation receiver assembly. 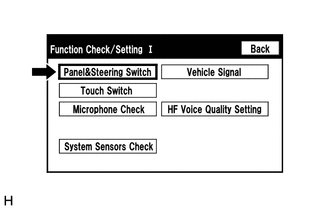 This screen is updated once per second when vehicle input signals change. 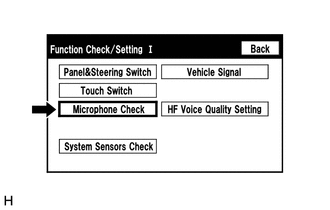 GPS information, vehicle signals and sensor signals are checked in the following procedure. 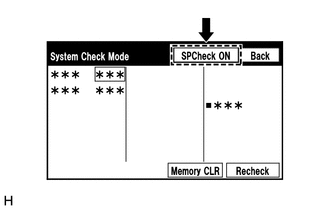 (c) Select "System Sensors Check" from the "Function Check/Setting I" screen. System is using GPS signal for location. System is tracking GPS signal for location. System cannot receive GPS signal (searching for GPS signal). High accuracy 3-dimensional location method is being used. High accuracy 2-dimensional location method is being used. 3-dimensional location method is being used. 2-dimensional location method is being used. Location data cannot be used. The ratio of satellites performing 3D positioning, Hyper 3D positioning and Hyper 2D positioning is displayed. The ratio of satellites performing 2D positioning is displayed. The ratio of satellites not performing measurement is displayed. Date/time information obtained from GPS signals is displayed in Greenwich Mean Time (GMT). Latitude and longitude information on current position is displayed. The amount of change in bearing angle (degrees) after the system sensor check screen is displayed (clockwise: "+", counterclockwise: "-"). When this switch is pressed and held for 3 seconds or more, the values for the display items of SPD and Sensor Signal are reset and display "0". 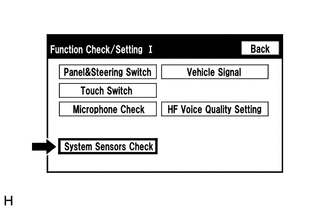 (1) When the "System Sensors Check" screen is displayed, check all the sensor signals. Displays the date and time in the device. Setting is possible only when GPS signals are not being received. Moves the cursor on the date and time setting screen to the right and left. Adjusts values of items selected by the cursor. Selecting this switch after setting the date and time updates the date and time in the device (only when GPS signals are not being received). (1) When GPS signals are not being received, the date and time in the device can be adjusted. Time setting is possible only when GPS signals are not being received. 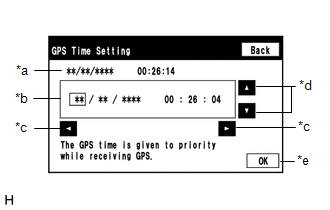 When the navigation system is receiving GPS signals, priority is given to displaying the time and date received via GPS. (a) Duplicate the problem symptom. 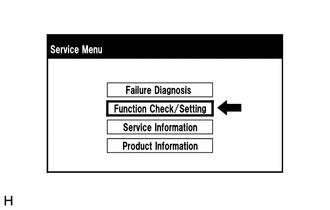 (b) Check for DTCs and repair the systems for which any DTCs are output (See page ). (c) Check cellular phone compatibility. (1) Go to Toyota website and check if the cellular phone/vehicle is compatible. (2) If the cellular phone is not compatible, recommend to the customer a compatible cellular phone. (d) Delete all paired devices from the cellular phone. (1) The procedure varies based on phone model. Contact the service provider or cellular phone manufacturer if assistance is required. (e) Remove the Entune app from the phone. Only perform this step if the customer is present and approves. (1) Turn off the phone and remove the battery for 15 seconds. For instructions on how to reset cellular devices, refer to the appropriate manufacturer's website. (h) Delete all personal data from the head unit. (1) Delete all personal data from the head unit. 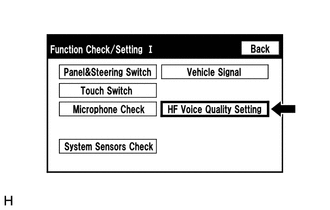 Re-installation of applications must be completed before applications will appear on the head unit. (i) Disconnect the cable from the negative (-) battery terminal. (1) Record all radio station presets. (2) Disconnect the cable from the negative (-) battery and leave it disconnected for 2 minutes. (j) Check if the problem symptom has been repaired. 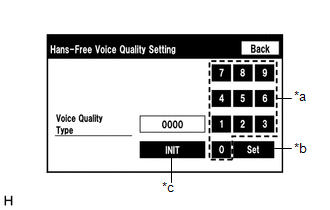 If the quality of phone calls decreases due to the changed settings, return the settings to "0000" by pressing the "INIT" switch. 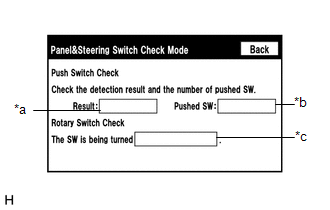 (1) The "SP Check OFF" switch is pressed. 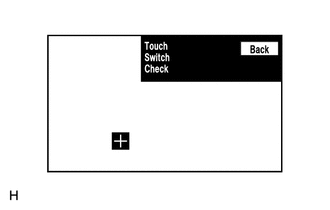 This function is used to check the cause when the navigation receiver assembly screen is blacked out. (4) Enter the following menus: Body Electrical / Navigation System/ Utility / Software Error History. (5) When an item is stored for Software Error History, record it before repairing the navigation receiver assembly. 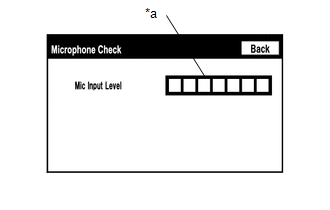 This function is used to check the cause when an optical disc error occurs. (4) Enter the following menus: Body Electrical / Navigation System/ Utility / Optical Disc Error History. (1) When DTCs are cleared using any of the following operations, Optical Disc Error History will be cleared as well (See page ). In order to inspect the RSE, a disc should be inserted into the navigation receiver assembly. Depending on the vehicle, some of the items are not displayed on the "Error Detected Image Line (Type)" screen. This function is used to check the map version of the navigation system and the end date of the map update service. (4) Enter the following menus: Body Electrical / Navigation System / Utility / Map Information. (5) Check the map version and the end date of the map update service.